OJEE 2019 is conducted by the government of Orissa, state. OJEE is a state-level entrance exam, also known as Odisha JEE 2019. This entrance exam is organized to provide admission in various courses like 1st year of degree course of Pharmacy & Integrated MBA (5 years), lateral entry in Engineering /technology/pharmacy/MCA and 1st year of master courses in MCA, M.Tech, MBA, M.Pharm, M.Arch/ M.Plan/ M.Arch (Exe.). Latest Update: OJEE 2019 Admit Card is Expected to be released on 26th April 2019. Check the Admit Card link below. Latest Update: Notice regarding extension of last date for online application has been released!! Check New Schedule Below. Latest Update: OJEE 2019 Registration will Start at 3:00 PM on 30/01/2019 !! Check the Procedure, Schedule Below. 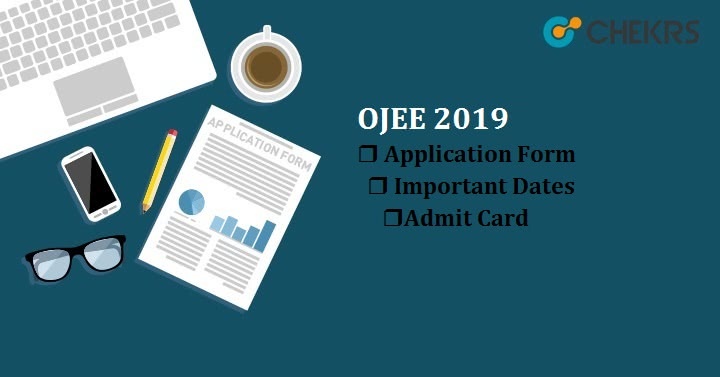 Latest Update: OJEE 2019, Application Form Last Date, Admit Card Releasing Date and Exam Date Announced!! Check the Table Below. From the year 2016, new rules are regulated for admission in B.E./B.Tech & MBBS/BDS. Admission in B.tech will be done on JEE Main scorecard and for MBBS/ BDS course admission will be done through NEET Score. The state government of Orissa will decide the OJEE eligibility criteria and publish on the official website. It is necessary to meet all the OJEE Eligibility Criteria before appearing for the exam. Candidates who don’t meet the eligibility criteria of OJEE will not be considered for admission in various colleges of Orissa, state. Please check the eligibility criteria before filling the registration form or application form for the entrance exam. Must have passed 10+2 with Science and Mathematics. Must score minimum 45% marks in qualifying exam (For reserved categories it will be 40%). Minimum age should be 17years & no limit for maximum age. Candidates should have domicile of Orissa state. OJEE commonly known Odissa Joint Entrance Exam is a state-government controlled centralized exam for admission to many private and governmental medical, engineering & management institutions in Odisha. Every year more than 2 lakh students appear for this exam for undergraduate and post-graduate courses. OJEE Exam Date and dates related to admission process will be announced by the state government of Orissa on the website www.ojee.nic.in .we are providing the important dates of OJEE. You can check the dates and prepare yourself accordingly. Odissa JEE Application form will release in last week of January 2019 and will be last up to the 3rd week of March 2019. OJEE Application Form will publish online by the state government of Orissa on their official website www.ojee.nic.in or www.odishajee.com. Interested candidates can check the portal regularly to get the updates related to Odissa JEE Application Form. Click on the fill the OJEE application form. Fill the personal details and upload scanned photograph, left-hand thumb impression and signature. Pay the fee through online mode. The application fee may vary according to the category. OJEE Syllabus is different for all courses. For MBA, the syllabus will be comprised of Verbal & analytical reasoning, comprehension, GK, etc. For B.tech/ B.Arch, the syllabus will be comprised of Physics, Chemistry & Mathematics. Candidates can check the official website of OJEE for entire syllabus according to their course. The detailed syllabus is provided for applicants by the official authority. You can check and download the complete. There will be total 60 questions per hour, vary with course. Type of question will be objective. +4 marks will be allotted for each correct answer and for each wrong answer -1 will be deducted. Check the previous year sample paper, it will be helpful to you to achieve good marks in OJEE exam. Students who want to appear in OJEE Exam this year can download the OJEE Previous Year Papers with Solution. Prepare according to the proper time for each task. Think positively, it will lead you to success. Do work smartly. Make separate sheets for formulas and theorem. Take a gap or break while study continuously. Get OJEE Previous Year Papers and Solve them. The authority of OJEE will announce the availability of admit card in the month of April online. Students can visit the official website to download the OJEE Hall Ticket. Admit card will be available only for students who registered themselves successfully. TheAdmit card contains all the information like exam centers, the name of students, roll number, applied course, exam date etc. Visit the website ojee.nic.in or www.odissajee.com . Click on the link to download “OJEE 2019 Admit Card”. Enter the application number and date of birth and then submit it. It will proceed to the next page, where admit card will be displayed on the screen. Download it from there and take the printout of it. Must carry during the examination. OJEE Answer Key will be published online after conducting the exam successfully. Every year, the authority of OJEE releases the answer key on their website. Students who appeared for OJEE exam can match their answers with the released answer key of OJEE Exam. Answer key for each course will be released on different date and dates are not fixed for each course. The cut-off for OJEE will be decided by the authority of Joint Entrance Exam Cell, Orissa. Cut-off marks is a closing mark on the basis of which aspirants get admission in government and private institutes. OJEE 2019 cut-off will publish separately for various courses along with the OJEE result on the official portal. The candidate who score above or same as cut-off marks will get admission in government and private colleges of Orissa state. Result declaration date is not confirmed yet but we are expecting that it will declare in the month of June according to the date of result declaration in 2018.OJEE scorecard will available online at the official website. It will be declared by the Joint Entrance Exam Cell, Orissa. Applicants can visit the portal and download their OJEE 2019 Result.